TORONTO, ON – December 6, 2018 –The Lexus UX – an all-new model for 2019 – is the urban explorer that Canadians have been waiting for. This fresh take on the compact luxury crossover features city-smart technology and bold urban style that’s designed to enable active lifestyles. To celebrate, Lexus introduces the UX with pricing that makes it hard to resist. The 2019 Lexus UX 200 is built around a responsive 168 horsepower four-cylinder engine and front wheel drive. It offers top of class standard equipment at the very competitive starting MSRP of just $37,100. 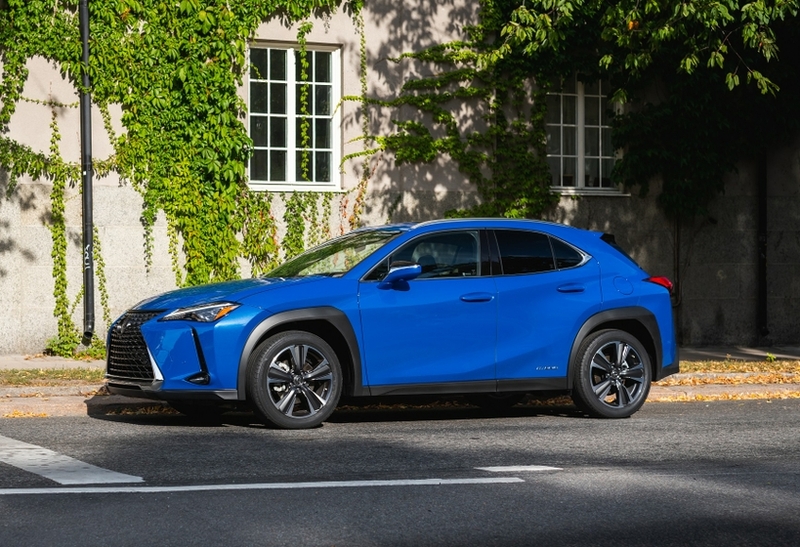 The 2019 Lexus UX 250h adds the newest Lexus all wheel drive technology – known as eAWD – plus the efficient power and low emissions of a 175 net horsepower self-charging hybrid system. Compared to the UX 200, this model delivers additional all-weather driving confidence, plus more horsepower and better fuel efficiency, for just $2,600 extra – with a starting MSRP of just $39,700. The UX stands out from the crowd with convention-shattering design. The bold signature Lexus Spindle Grille and dramatically flared fenders emphasize the UX’s strong crossover qualities. Its nimble performance and excellent maneuverability shine through in details like aero-stabilizing blade lights and aluminum wheels featuring aerodynamic designs. Rear combination lamps connected by a continuous single line of 120 LEDs round out UX’s innovative character and cutting edge appeal. Also breaking with convention, this compact crossover comes in a dazzling palette of new colours – including Celestial Blue, Cadmium Orange and Nori Green Pearl. The design of the new UX also blurs the boundary between exterior and interior. The hood appears to flow seamlessly into the instrument panel, creating a sense of continuity. The driver-centric cabin offers a commanding view of the road, with controls harmoniously at hand and technologies designed to elevate the experience. The UX offers ample space for five adults in comfortable seats clad in NuLuxe. Power adjustable front seats are heated and ventilated. Dual zone automatic climate control lets occupants tailor the interior to suit individual preferences. Rear seat passengers enjoy an airy, open space – while the 60/40 split rear seats maximize versatility when it comes to mixing people and cargo. With the rear seat stowed, the UX offers plenty of cargo capacity for weekend getaways. The UX 200 is a front-wheel-drive model built around a new 2.0L inline four-cylinder engine. This powerhouse delivers both high performance – at up to 168 horsepower – and impressive fuel efficiency. It’s paired with a new Direct Shift continuously variable transmission, which combines the creamy-smooth performance of a conventional CVT with the more direct feel of a traditional gear-driven automatic. The UX 250h self-charging hybrid brings the most proven hybrid technology on the planet to the UX – and the first hybrid powertrain to the compact luxury crossover segment. The result is an incredible blend of power and efficiency. The fourth generation Lexus hybrid powertrain generates 175 net horsepower while minimizing fuel use. This model is further enhanced with the innovative Lexus electric All-Wheel-Drive system. When accelerating, cornering or driving on slippery surfaces, eAWD automatically engages an additional motor on the rear axle and adjust the power split between front and rear. The result is exceptional handling stability and greater traction across a wide range of driving situations – giving the UX 250h the responsiveness of a hatchback plus the all-weather confidence and security of a crossover – and all without compromising fuel efficiency or cargo space. All UX models are technology showcases, with a long list of standard equipment. Lexus Display Audio systems include Bluetooth connectivity, USB audio input and controls mounted on the steering wheel. They’re enhanced with Apple CarPlay and Lexus Enform – integrating Enform App Suite 2.0, Enform Safety Connect and Scout GPS Link for navigation. As a Lexus, the 2019 UX series also offers drivers and passengers peace of mind through a comprehensive safety package – starting with Lexus Safety System + 2.0. This is the second generation of LSS+, which is standard equipment on 98% of all new models Lexus offers in Canada. LSS+ 2.0 supports the driver’s awareness and decision-making under a variety of traffic conditions and contingencies. Features include the pre-collision system with pedestrian detection extended to low light conditions plus daytime bicycle detection, lane departure alert with lane tracing assist, dynamic radar cruise control, and an automatic high beam system. Other standard safety features include Lexus Enform Safety Connect, the Blind Spot Monitor system, a backup camera, 10 airbags, a direct tire pressure monitoring system, rain-sensing wipers, anti-theft system and more. The 2019 Lexus UX 200 (starting MSRP: $37,100) is standard equipped with many premium features – including a leather wrapped steering wheel and shift knob, multi-information display, six-speaker audio system with 7-inch display screen, an auto-dimming rear view mirror with integrated compass, tonneau cover, 17” alloy wheels, power adjustable heated exterior mirrors, a power moon roof, roof rails, Bi-Beam LED headlamps with washers, LED daytime running lights and clearance lamps, and more. This model may also be ordered as the 2019 Lexus UX 200 F SPORT Series 1 (starting MSRP: $39,400), which pairs the UX’s performance with a more aggressive style. Features in this package include paddle shifters, a heated steering wheel, the Lexus Active Noise Control system, and LED fog lamps and cornering lamps. F SPORT exclusive details include 18” alloy wheels, the steering wheel, front grille, sport seats, shift knob and scuff plates. The 2019 Lexus UX 250h eAWD Luxury Package (starting MSRP: $44,900) adds numerous technology enhancements – including a head-up display, 10.3” Display Audio, eight speakers, upgrades to the Enform system including embedded navigation, traffic and weather plus Enform Destination Assist, intuitive parking assist with auto braking and the Qi wireless charging tray for personal electronics. Other upgrades include a hands-free rear lift gate, a driver’s seat memory system linked to exterior mirrors, auto tilting reverse mirrors, an exclusive instrument panel featuring trim inspired by “Washi” handmade Japanese paper, an integrated garage door opener, and a single-knob ventilation control with wireless lighting. The 2019 Lexus UX 250h eAWD F SPORT Series 1 (starting MSRP: $41,800) builds on the base model, adding more aggressive style. Features in this package include the Lexus Active Noise Control system and LED fog lamps and cornering lamps. F SPORT exclusive details include 18” alloy wheels, the steering wheel, front grille, sport seats, shift knob and scuff plates. The 2019 Lexus UX 250h eAWD F SPORT Series 2 (starting MSRP: $48,500) enhances the Series 1 package, adding numerous technology enhancements – including a head-up display, 10.3” Display Audio, eight speakers, upgrades to the Enform system including embedded navigation, traffic and weather plus Enform Destination Assist, intuitive parking assist with auto braking and the Qi wireless charging tray for personal electronics. Other upgrades include a hands-free rear lift gate, a driver’s seat memory system linked to exterior mirrors, auto tilting reverse mirrors, triple LED headlamps, and an integrated garage door opener.